We recently ran a Kickstarter to fund two new albums. 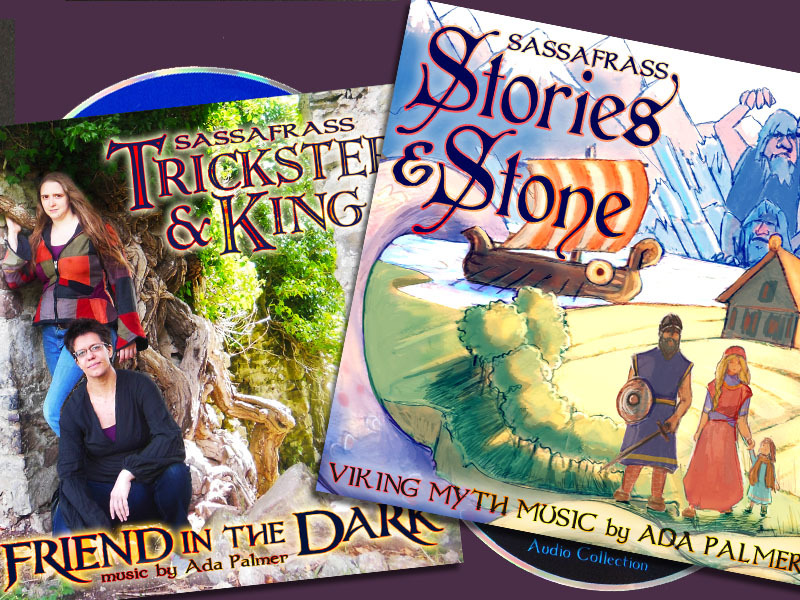 The first “Stories & Stone” collects alternate arrangements of our Norse music. “Friend in the Dark” has fresh recordings of our earlier music. Both albums are now streaming on our Bandcamp site. 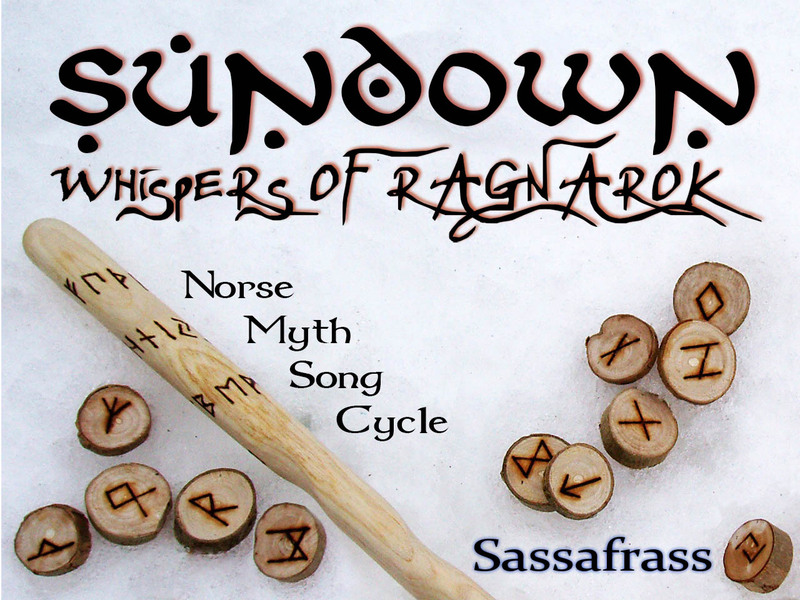 “Stories & Stone” is a companion album to our musical retelling of Norse Mythology, Sundown: Whispers of Ragnarok. These songs narrate the history of the cosmos according to Viking legend, from the creation of the world to Ragnarok and the new world beyond, focusing on the death of Baldur, and the strife between Odin and his blood-brother Loki. 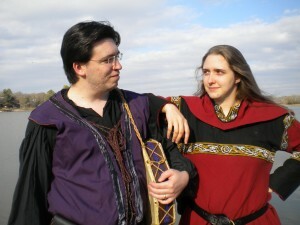 The Sundown Project is both an album and a play, performed in period costumes. 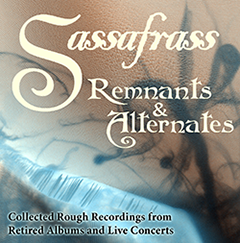 Sassafrass used Kickstarter to raise funds for both (see our list of generous contributors). You can buy the CD from CDBaby or a digital download from Bandcamp. You can also listen to the whole album streaming free online. 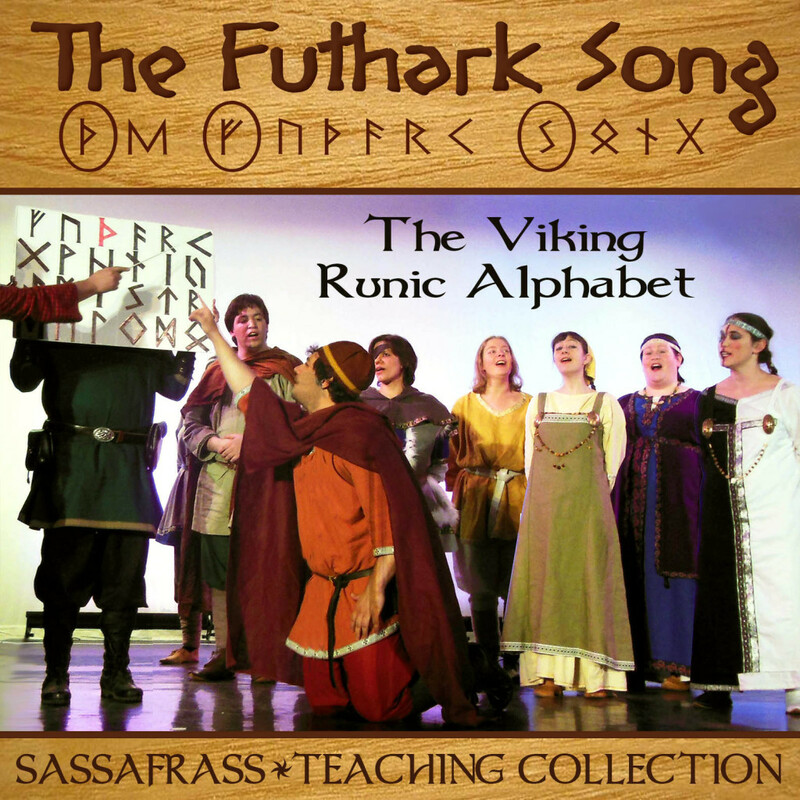 Combining a folk style with medieval modes, complex close harmony and multiple sets of competing lyrics, these songs present detailed and lively retellings of the myths, illustrating different characters’ competing perspectives, and the rival worldviews of gods, giants and mortals who compete to survive in the harsh cosmology imagined by the Vikings. 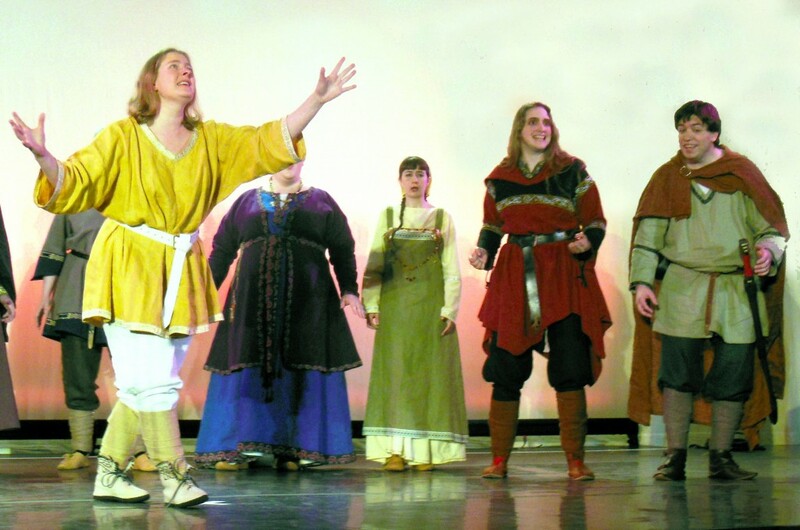 The songs are closely based on medieval Icelandic sources, and present the stories as they have been handed down, but expanding upon the perspectives of the different participants to bring new depth to the characters. 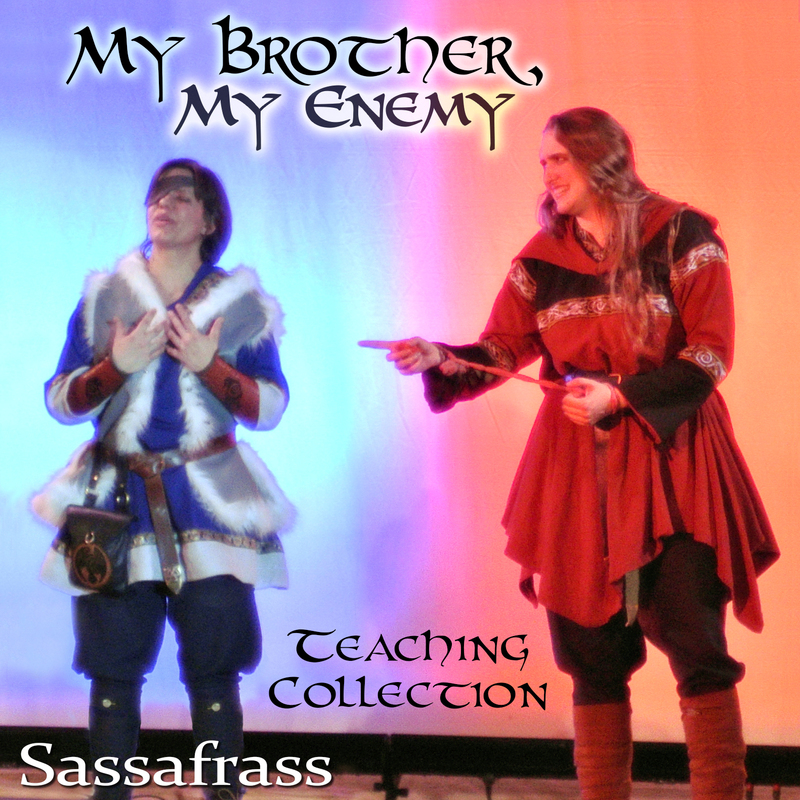 In this example, “My Brother, My Enemy,” Loki and Odin describe how they met, and how their friendship turned into the bitter animosity which leads to Ragnarok. The songs also examine aspects of Viking culture, especially the tradition of skaldic poetry, riddles, runes, and the value placed on storytelling as a form of passing on history. The album, contains the twelve songs in which the stories unfold, recorded and professionally edited. With funds from the Kickstarter, we were able to include a 24-page booklet containing all the lyrics to the pieces, some of which are more than ten minutes long with up to seven different parts each with unique lyrics. Kickstarter funds also helped us make the album green, with recycled packaging and using recyclable and biodegradable materials. From the stage debut: Baldur describes a dream in which he foresaw his death. Learn more about our period Viking costumes. 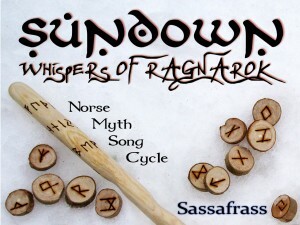 Sundown: Whispers of Ragnarok by Sassafrass The video below is a preview sample of the video shot at the debut performance at Balticon. This shows the full version of our finale “Longer in Stories than Stone”, though without the final color correction and high resolution of the DVD version. 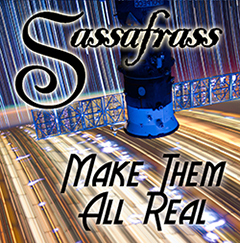 This preview was released in celebration of Sassafrass receiving a nomination for the Pegasus Awards for Excellence in Filking, in the categories of Best Performer and Best Composer/Songwriter (for our composer Ada Palmer). Sundown: Whispers of Ragnarok has been ten years in the making, from the composition of the original music through the development of the characters, script and costuming. We hope you will share our excitement, and continue to explore these pages and learn more about the project. All funds go directly to production costs, costuming, and to paying for our performers to travel to concert venues. Sassafrass can’t perform without help from friends like you. You can also support us by purchasing our other music and merchandise, available through Bandcamp.